At this professional seminar, LMA and St Bartholomew’s Hospital Archives will share their approaches to opening up access to medical records in their collections through two current projects funded by the Wellcome Trust Research Resources in Medical History scheme. Speakers include: Philippa Smith, Lara Speroni, Giorgia Genco, Kate Jarman and Rebecca D’Ambrosio. My name is Lindsey Sutton and I am the Project Archivist employed on the Wellcome funded Unlocking the Asylum project at Denbighshire Archives. The project began in October of this year and is due to run until November 2019. The North Wales Hospital, Denbigh, was the main institution in North Wales for the care of the mentally ill. The institution opened in October 1848 serving the whole of North Wales and the borders. A century later, its patients numbered in excess of 1,500. It was by far the biggest employer in the area and activities recorded in its voluminous archives reflect its importance in the social and economic life of the area, with its farm, sporting activities, community events and cultural festivals. The hospital finally closed its doors in 1995. The resulting archive is unique in its completeness including: patient records; annual reports and committee minutes; financial records; plans; and staff records. The project team is made up of three roles. There is the Project Archivist (myself), whose role is to produce an itemised catalogue of the existing accessions re-catalogued to current standards and an itemised catalogue of later accessions of administration records. There is a Project Support Officer who will spend two years indexing and repackaging the later series of patient case files, some 23,000 in total. Finally there is the Project Conservator who has been employed for three months to assess the collection for conservation needs and suggest preventive preservation measures. We are now three months into the project and the first phase to re-catalogue the existing accessions is now complete, the temporary catalogue is available online via the Denbighshire Archives website. Work is also well under way on the indexing and repackaging of the patient files, of which just under 1000 have been completed. Additionally a detailed conservation survey has been completed, the repackaging recommendations of which will be implemented next year. If you would like to find out more about this project please see our two recent blog posts which look at the plans for repackaging the series of maps and plans, and take a closer look at the information contained within the patient files predating the establishment of the National Health Service in 1948. We will continue to post regular updates throughout the project on our blog and Facebook pages. In this post, Tiff Kirby, archives assistant at the Cambridgeshire and Huntingdonshire Archives, selects some of the notable items relating to history of medicine within the archives. From the sixteenth century, the Church certified both surgeons and midwives, and certificates from the Archdeaconry of Huntingdon are held at Huntingdonshire Archives. This certificate tells us Elizabeth Ratford’s mother was a midwife, and her father a surgeon, and that she learned her medical skills from her family. Other women testify to her expertise, and appear to have signed their own names – these are likely to have been other midwives. The certificate emphasises Elizabeth’s mother, who was for nearly forty years an approved midwife, and experienced in surgery. This register is very small, but its contents for the year 1666 trace the epidemic of plague through the parish, with page after page of deaths. Beginning with George Thompson, 95 people died between the 1st July and the 26th November. While cause of death was not routinely recorded in parish registers, ‘buried of the plague’ is written next to the entries at the beginning, becoming increasingly abbreviated, until simply a ‘p’ is written against the final burial. The case notes of the earliest patients at Fulbourn Hospital (originally called the County Pauper Lunatic Asylum for Cambridgeshire, the Isle of Ely and the Borough of Cambridge) were destroyed by fire in the 1940s, which makes the earliest admission register particularly important. The first page records that Elizabeth Pain, a needlewoman from the Parish of St Andrew the Less in Cambridge, was admitted with mania of unknown cause. 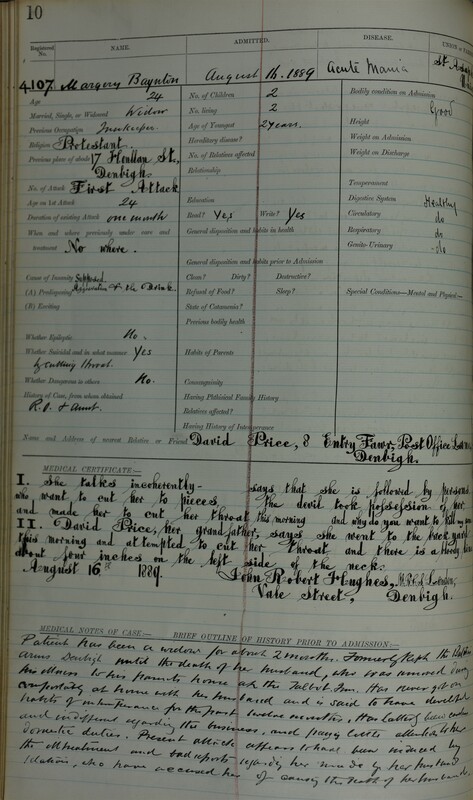 Elizabeth is indicated to be in otherwise good health, but we can see in the far-right hand column that the outcome wasn’t discharge and recovery, but that she died there in 1896 having spent decades in the Asylum. There are a variety of patients, on the same first page a lawyer, a shoemaker, a child of nine, with the largest group being labourers. Most admitted are described as having mania, melancholia, dementia and epilepsy, although these terms were not necessarily used consistently and changed their meaning over time. As well as being an eminent dental practitioner Dr John McLean OBE (1994-95), a past-President of the BDA, was a noted researcher. He was feted in many countries and was a visiting Professor in Fixed Prosthodontics and Biomaterials at America’s Louisiana State University. His particular research interests were in developing white filling materials. Subsequent to being appointed Clinical Consultant to the Laboratory of the Government Chemist, John, together with Dr Alan Wilson, introduced glass-ionomer cements to dentistry. This development opened up many new exciting possibilities for white fillings and established a new field of research and development in dental materials science. When he died in 2009 John left money in his will to a number of organisations, including the British Dental Association. However he did not specify how it should be used, other than to promote research. So the question was how best to spend it. John loved his profession. It was therefore decided to study and record the dental profession through the voices of living people, dentists and others. The studies were to take two forms: witness seminars and oral histories. The concept of Witness Seminars in relation to medicine and healthcare came to the fore in the early 1990s and was developed by Professor Tilli Tansey at the Wellcome Institute for the History of Medicine and later at Queen Mary University London. In the Group’s 21st anniversary year they produced an excellent review booklet of the whole series. Having been at the Wellcome for eight years I learned a great deal about these seminars. So together with Rachel Bairsto (Head of Museum Services at the BDA) and Professor Nairn Wilson (former President of the General Dental Council) we formulated a programme to examine aspects of dentistry: to collect memories and insights into the world of dentistry in the UK especially, but not only, from the time of the onset of NHS dentistry in 1948. Following discussion with the family and the BDA it was agreed to create an Archive which the Association’s CEO, Peter Ward, stated would be “the beginning of what we hope will provide a highly authoritative and valuable asset to future generations and thereby satisfy that aspiration”. He said the BDA intended that the Archive “will live and grow and metamorphose into a continuing story that maps the development of dentistry over years to come”. Obviously Witness Seminars require a lot of planning. A number of appropriate people were approached, told of the topic and asked if they would participate; also asked if they could recommend anyone else who might have something to contribute to the discussion topic. The BDA appointed an administrative assistant to deal with all the arrangements: booking rooms and refreshments, telephone calls, letters and emails, arranging for recording equipment and typing. On each day there were four hours of discussion, interspersed with breaks for refreshments. There were no papers but several people took a lead for specific topics, speaking for between three and five minutes. The chairman ensured people did not stray too far from the topic and that no one hogged the discussion. Every word spoken at the seminars was recorded and typed up. After initial editing by the chair for clear errors attendees were sent the typed script from their seminar to ensure accuracy and to add any afterthoughts (which could be inserted as footnotes). They were told that any of their filed papers or documents could be added as appendices. The documents were then revised and published in book form, with plans to make them accessible via the BDA website. All were authored by NH Wilson and S Gelbier as part of the series ‘Reports of a Witness Seminar’, London: British Dental Association 2014. In addition a number of oral history interviews have been recorded of both leading members of the profession, routine general dental practitioners and some ancillary workers. So John McLean has provided the means to develop an excellent archive before so many of the people concerned are no longer alive. PM Frost, Dr John McLean: His life and times, Dental Historian 2007; 44: 5-19. Obit John Walford McLean OBE, British Dental Journal 2009; 207: 187. EM Jones and EM Tansey (eds.) for The Trustees of the Wellcome Trust, Monoclonal antibodies to migraine; an A to Z of modern biomedicine, London: Queen Mary London University, pp 223. The next HARG AGM will be held at the Lifelong Learning suite, Borthwick Institute for Archives at the University of York, Heslington, York, YO10 5DD, 11am-4pm. 1. 10.30-11:00: Tea and coffee served. would wish to attend or have any other queries (healtharchivessite@gmail.com).